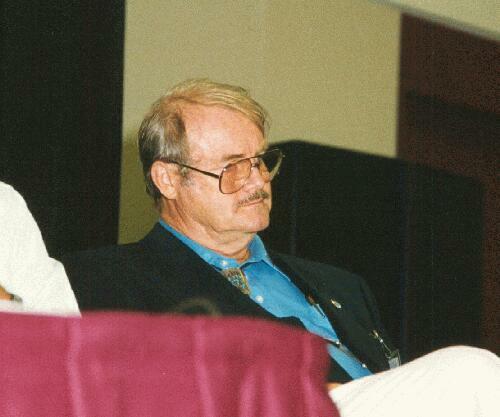 Jerry Pournelle died September 8 at the age of 84, his son Alex announced. Pournelle had just spent the weekend at Dragon Con, and wrote yesterday on his Chaos Manor blog that he came home with both a cold and the flu. Jerry was active in LASFS, where I knew him for over 40 years. We had a long talk this year at the Vintage Paperback Show. I’ll post an appreciation here tomorrow. 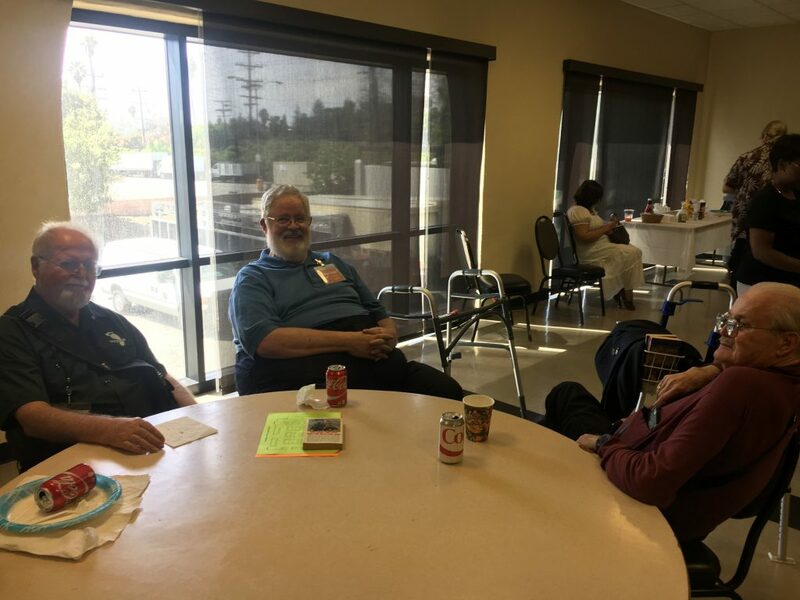 Larry Niven, Mike Glyer, Jerry Pournelle at the LA Vintage Paperback Show in 2017. Photo by John King Tarpinian. This entry was posted in In Passing and tagged Jerry Pournelle by Mike Glyer. Bookmark the permalink. This is so sad and so sudden. Jerry Pournelle’s fiction is some of the most enduring on my bookshelves. I send sincere condolences to his wife and family. Having read Matthew Kirschenbaum’s book about writers and word processors, I think it’s more accurate to say that Jerry Pournelle was one of the first three people to use a word processor, and we’ll never be sure who was first. But his importance in computing history should be noted. I think it was in Analog that he wrote a piece about using a word processor – with another author who had a different system, a Wang, iirc. That was in Asimov’s (I was just about to mention it), written with Barry Longyear (who had the Wang). Here’s the isfdb link http://www.isfdb.org/cgi-bin/title.cgi?897714 – the article is credited to Jerry and Barry, and to Ezekial (Jerry’s computer) and Wang 5/1 (Barry’s). I still have that ish in a box somewhere. The article definitely convinced me that I wanted a computer with word processing capability, but it was several years before I could get one (I was in high school in 1981). A man catches a cold, has a lie down, and dies. Such a damn shame and loss. My condolences to family, friends and those who’s lives he touched. @Mike. Last night, in a bar in Seattle with a bunch of folk from the tech world, we raised a glass to him with the toast “Ship it!”. I’m pretty sure he was nowhere near the first three people to use a word processor, unless you want to rephrase it as “non-computer scientist to use a commercial dedicated word processor to write a commercially sold science fiction novel” or similar. I mean, I wrote a user manual for a Software Engineering term project in 1981 via computer text processor, and UNC-CH was several years behind places like MIT and Stanford at doing that sort of thing. I’m sad he’s passed away, as I’m sad when anyone passes away, but really, nobody wants to mention the horrific racism in Lucifer’s Hammer? Or that he was a climate change denier and a Trump supporter and created a circle of hell in his Inferno sequel especially for Rachel Carson? No, rochrist, no one wants to talk about those things right now, when someone who was a significant writer in our field, a major fan, and a friend to many has just died and we are mourning his passing. Those things are utterly appropriate for discussion–but not right here, at this particular moment. It’s called decency and respect, and not just for the person who has died. rochrist: I wasn’t that sensitive to the racism in Lucifer’s Hammer when I read it decades ago, so that’s on me. Whether man made climate change is a fact, the proposed solutions lead to a vast transfer of political authority, and I think people get to express those opinions about all of that in a democracy. As for writing a fictional book in which Rachel Carson winds up in Dante’s Hell, that’s pretty mild stuff in my view. But Lis’ answer is better…. @rochrist disgusting to bring up such things at this time. I hope you’re ashamed, but I’m sure you’re not. I’m glad to see I’m not the only one who was taken aback by such an utterance. – Jerry will forever be remembered for contributions to the arts and sciences. May he Rest In Peace. I think of these posts as sort of miniature online funerals or wakes and try to let that guide my sense of what is appropropriate within the comment section. YMMV. Sorry to hear of this. It’s good to read the memories here. + 1 to Lis Carey and to Meredith. A big chunk of Dr. Pournelle’s fiction wasn’t for me, but I read his columns (sometimes with my hair on fire) and I have an abiding fondness for the There Will Be War books. Also, he really was a giant. Read his books from the age of 14 a huge influence on my life. Condolences to his family. A great loss! Tom Galloway: I think it’s better to say that Jerry Pournelle was one of the first three authors to use a word processor, along with David Gerrold and Gay Courter. Mostly only read Pournelle in his collaborations with Niven but those were some of my foundation sci fi works, especially The Mote in God’s Eye. Sad to hear of his passing, especially when it came with so little warning. I’m sure his family will be devastated. Pournelle got a nice Honorary Unsubscribe (an obituary for people who made a difference in the world but are generally not well-known) from “This is True” publisher Randy Cassingham, a fellow former JPL employee. Jerry was quite the cat. I look forward to his collected works.